Uruguay Tries To Tame A 'Monster' Called Cannabis : Parallels Uruguay's audacious new law not only legalizes pot but also mandates that the government grow and distribute it. Some say the government has pinched more than it can roll. 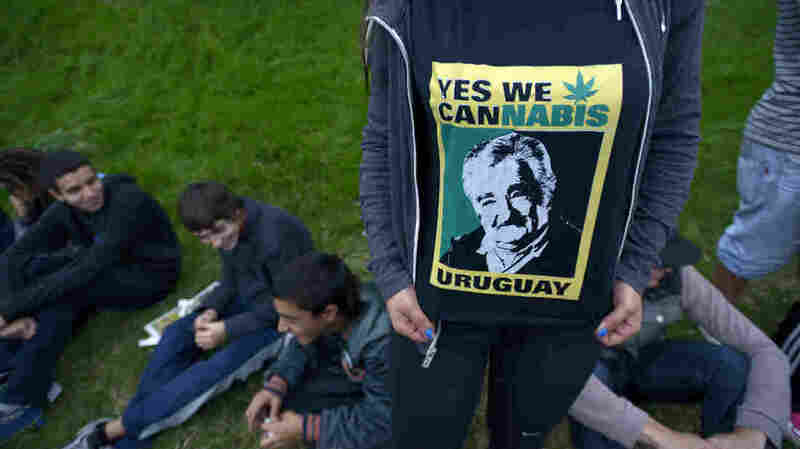 Outgoing Uruguay President Jose Mujica's face illustrates a T-shirt supporting his new law legalizing marijuana. Uruguay's citizens are voting for Mujica's replacement on Sunday, and the expected winner is a candidate from his party. To gauge international interest in Uruguay's legal cannabis market, spend just a few minutes at a small marijuana shop called Urugrow in Uruguay's capital, Montevideo. In a period of about 10 minutes, owner Juan Manuel Varela gets a call from Brazil. A man from Canada shows up to see what the market would be for his company, which sells child-safe packaging for marijuana products. Shortly after, two American travelers stop by looking to score weed. Another lurking pot-preneur, Argentinian Mauricio Luporini, explains to them that under the new law, selling to foreigners is illegal — to their obvious disappointment. Afterwards, Luporini says that he is also looking to get a piece of the cannabis market. "Uruguay is such a little country, with such few people," he says. "The speed of the people is slow, you know. But It has a great potential." 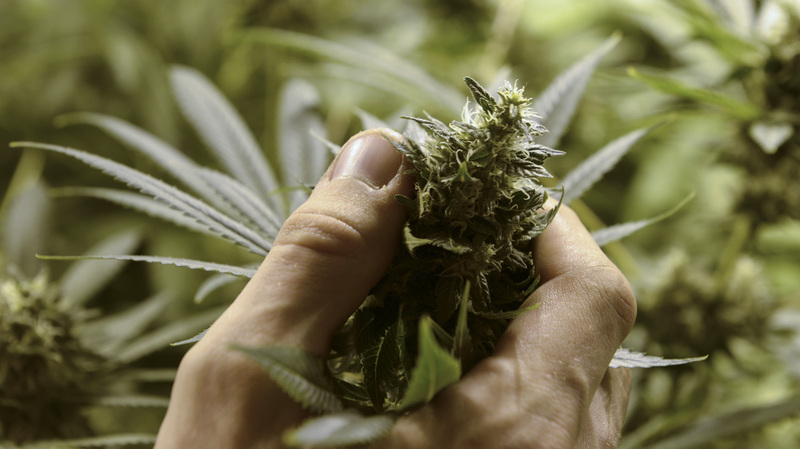 The law allows Uruguayans to register to grow their own weed, or join growing clubs — cooperatives of up to 45 people — for personal consumption. Under President Jose Mujica's maverick leadership, Uruguay went further than any country in the world: The government will plant, cultivate and ultimately distribute marijuana, too. Mujica says decades of failed drug war policies necessitated a radical new approach to curb drug violence and addiction. If the government sells dope, the idea goes, the criminals can't. But the reality has proven complicated, and some advocates say the government has bitten off more than it can chew. "I think the Uruguayan government has been invaded by a big monster, which is called cannabis," Luporini quips. Under a tarp tied to a rusted car, dozens of cannabis plants are being pruned in the summer sun at a new growing club. The club is located in a small house with Che Guevara and Bob Marley posters on the wall and a sign outside that shows a cannabis leaf. For the club, the new law is about community and progress. 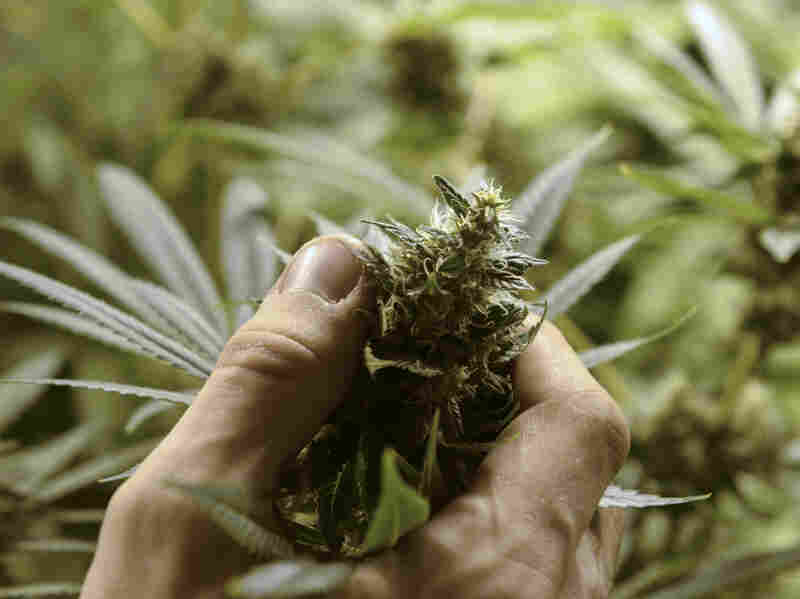 A legal marijuana crop in Uruguay. "We don't see this as a business," says Julio Rey, the president of the Cannabis Growers Association of Uruguay. "We see this as a social advance and a victory of rights." And that is part of the wider issue here — everyone sees the law a different way. Rey objects to the requirement to register people as an unnecessary headache and he doesn't want to see the industry commercialized, unlike the businessmen flooding into the country. Club members have been traveling around the country to inform rural residents about the new law and how it works. Despite the publicity and world-wide attention, only about 15 clubs and 1,000 people have registered for the government program. Rey explains this is partly as a cultural issue — pot smoking flourished in the shadows for a long time. But he worries if people don't sign on, the black market in cannabis will thrive. Others are concerned that tourists, unable to buy legally, might turn to criminals for their pot. The government faces even greater challenges. It has had to change the planned location of its marijuana fields — Rey says no one in Uruguay knows how to plant marijuana on an industrial scale — and who will guard it. So far the project hasn't gotten off the ground. There's also fierce debate about how the drug will be distributed. The law calls for pharmacies to do it, but that has raised other questions, like how should this product be taxed? "If you tax it like cigarettes, for example, you will make it too expensive," says analyst Ignacio Zuasnabar of Uruguay's Catholic University. "It won't be competitive, and people will still go to the black market." Pablo Iturralde Vinas, a right-of-center opposition politician, worries about the government's plan to plant and sell drugs. "The state is very inefficient in the grand majority of the things it does," Vinas says. "So imagine, planting marijuana will be equally inefficient. The government will probably have a great number of public employees that will produce something that is vastly more expensive." Implementing the law is "one or two months behind schedule," acknowledges Julio Calzada, who oversees the law as secretary general of the National Commission on Drugs, but he says the stages are going as planned. "This is the first time this has been done anywhere in the world," Calzada says. "There are a lot of things we are inventing from nothing." Or as another Uruguayan said, with a mixture of chagrin and pride, "We are kind of just winging it."